Parking brake cables for an old car can be hard to find and when you do stumble upon one the price might be as high as $150 (or more). Even at such prices, the appearance of the replacement cable may not exactly match the appearance of the "factory" cable. If it's a NORS (new old replacement stock) part it's a surviving aftermarket part from years back and it will probably work fine, but it may have differences in appearance from an original factory part. The '48 Chrysler we are restoring had a perfectly good factory-installed parking brake cable, but it didn't look original. 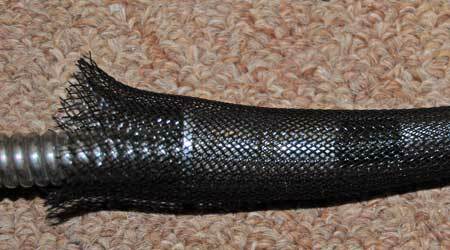 When the car was new, the cable had a black woven fabric covering on it; the kind of covering you see a lot on 1920s to 1950s cars. Over the years, age and the elements took their toll on the fabric causing it to shred and to get brittle and come apart. It was also greasy and had that dirty tan road grit look to it. Most of the fabric had disintegrated. 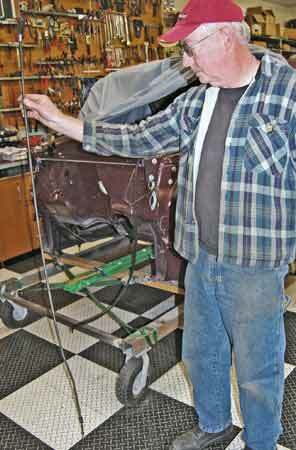 Bob Hansen of Gunner's Great Garage holds the parking brake cable for the '48 Chrysler behind him. Due to age and years of storage the black woven fabric that once covered this cable has deteriorated and crumbled to pieces. This wasn't solely an appearance problem either. The factory put the black fabric cover on the cable for a reason. It served to keep dirt and moisture off the coiled metal cable and it also padded and protected the cable a bit in spots where it was clipped to the car's frame. Our customer wanted a factory look throughout the car and we also wanted the cable to be properly protected. 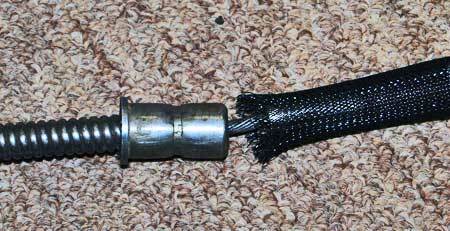 This end of the parking brake cable has (left to right) a collar, an attaching bracket and a metal bullet on the end to keep it from pulling through. Some fabrication would be necessary to remove and replace the bracket. If the cable was just a pieces of cable, it would have been easy to get some kind of black woven fabric and slide it over the cable. We're not sure the local parts store would carry such a covering, but you can probably find something like that on the Internet or from Wire Care (www.wirecare.com), a company we've written about before. However, our cable wasn't just a cable. It had attaching hardware on both ends. Some of the hardware was not removableâ€”or at least not easily removable. We needed a covering that could expand enough to pass over the hardware, and then shrink back down to the same size as the diameter of the cable, which was roughly about 3/8th inch. Here's the bracket on the other end. 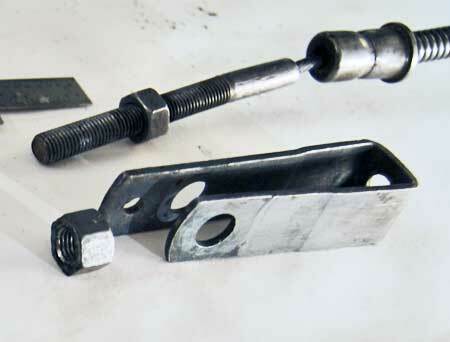 It is held on by two nuts that can be removed, In fact, the bracket itself can be lightly squeezed and used as a tool to remove the nut inside it. You can use a ruler to measure the position of the nuts if you remove both of them. Once the attaching bracket is removed like this, the only obstructions the expandable black fabric sleeving has to pass over is the nut and the collar on the right in the photo (or only the collar if you remove the second nut). We knew that Wire Care sells a lot of "cable management" products that car restorers can also make good use of. Many of its products were actually designed for neatly routing computer cables, but let's face it, a cable is a cable. Anything that covers a computer cable will also cover or "sleeve" cables on a car. But how could we get a covering over the hardware on the ends of the cable? It turned out that Wire Care actually had two products that we could use to sleeve our parking brake cable. One was called Flexo Overexpanded Braided Sleeving UL94 Part No. O0.38BK. The other is called Flexo Pet Expandable Braided Sleeving UL94 Part No, N0.38BK. To understand how these products work, think of those photos you've seen in which a snake swallows a mouse and you can see the snake's throat stretching over the mouse's body as he gets gulped down. The Flexo Braided Sleeving stretches over the metal fittings on the ends of the cable, then returns to its smaller diameter once it has been installed. We were not aware that these products existed, but when we contacted Wire Care by email, we got a quick answer that there were products we could probably use to make the parking brake cable look original again. They quickly shipped us a box of samples to test for our application. 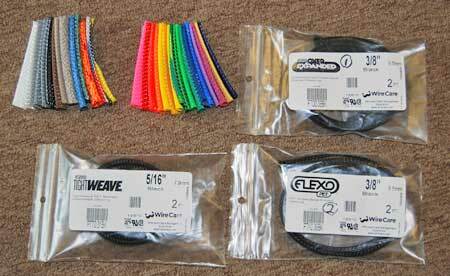 The samples were two-foot long pieces of several types of braided sleeving, plus a color sample. Wire Care's sample package included two examples of different colors available a two-foot-long samples of black woven sleeving. The packages marked (1) and (2) contain two types of 3/8-in. expandable sleeving, which is what we used. The other package had 5/16-in. expandable sleeving. The hardware on one end of our cable (see photos) wasn't easily removable, but the other end had a bracket that could be removed with little effort. Once the bracket was off, there were only a couple of collars that the sleeving would have to pass over. When it is pushed against obstructions such as these collars, the end of the sleeving expands enough to make the pass over. Once it is pushed beyond the obstructions, it contracts back down to the 3/8th diameter (without being heated). So, it tightens up around the cable. 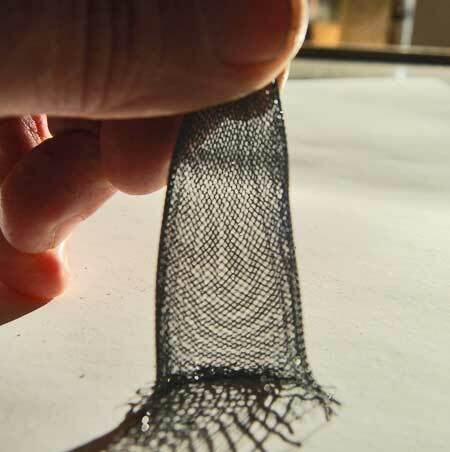 Pushing the braided sleeving against a surface or an obstruction expands it like this. The frayed ends can be sealed by quickly passing a flame over them. The sleeving is actually plastic, not fabric, but it has just the right look. Here the braided sleeving is being pushed on the cable from the right towards the left. It has already passed over the stop nut and is almost pushed up to the collar on the end of the coiled sheathing. Here's the black expandable sleeving passing over the collar on the end of the coiled metal sheathing that the cable slides through. As we said, it's like watching a snake swallow a fat mouse. Once the sleeving is pushed onto the parking brake cable, it goes back to 3/8 in. and gives the cable back its original look. If you wanted to you could trim and flame the end. This test worked out well, so now we need to order a piece of the black sleeving long enough to cover the entire parking brake cable. With our sample pieces, the ends of the expandable sleeving were slightly frayed and the fit around the parking brake cable was just slightly on the loose side. The fraying can be taken care of by trimming and then quickly flaming the end of the sleeve. The loose fit was so slight that we don't think it will be noticeable when we purchase a long enough piece of sleeving to cover the whole cable. If it's more of a problem then we expect, a heat gun may tighten it or some type of adhesive lightly sprayed at certain spots on the cable might help. We could also go to a 5/16-in. expandable sleeving that Wire Car sells. Since it is there mostly for appearance, we think the 3/8-in. will look perfect when the whole cable is covered with it.